The islands are a huge hit with tourists thanks to beautiful beaches and iconic spots. So here’s everything you’ll need in our Nusa Islands Bali guide. Travelling to Bali? Don’t leave without travel insurance! Read our Travel Insurance Guide or click HERE to get a quote. What To Pack? We’ve put together our Ultimate Travel Packing List for every type of trip. What Are The Nusa Islands? The Nusa Islands are three small Indonesian islands just a 40 minutes fast boat ride from Bali. They consist of Nusa Penida, Nusa Lembongan and Nusa Ceningan and are all so easily accessible from the mainland. An absolute MUST visit if you’re heading over to this area of Indonesia. Everywhere on the Nusa Islands is reachable within a one hour drive. So renting a scooter for the duration of your stay and exploring on two wheels is definitely the easiest option. 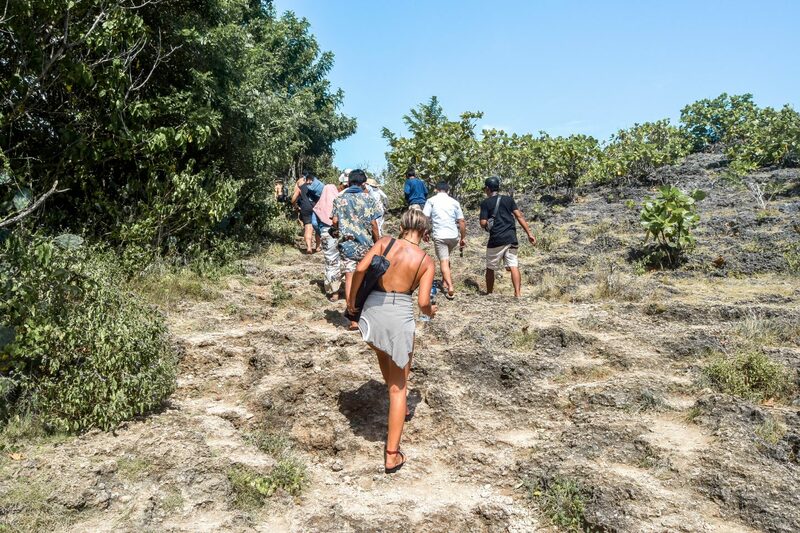 That being said, travelling around the Nusa Islands can be a challenge as some parts are a little bumpy and the grounds aren’t as up to scratch as the tarmac of Bali so please be careful! You can grab a scooter for around 70,000 IDR per day and explore yourself. Or if you’re not comfortable renting a scooter you can barter with the local taxi drivers to take you around the islands for a day rate – should be no more than 600,000 IDR per day. We covered most of the things to do on Nusa Lembongan & Nusa Ceningan in just a single day, and covered nearly all of the things to do in Nusa Penida over 3 days! 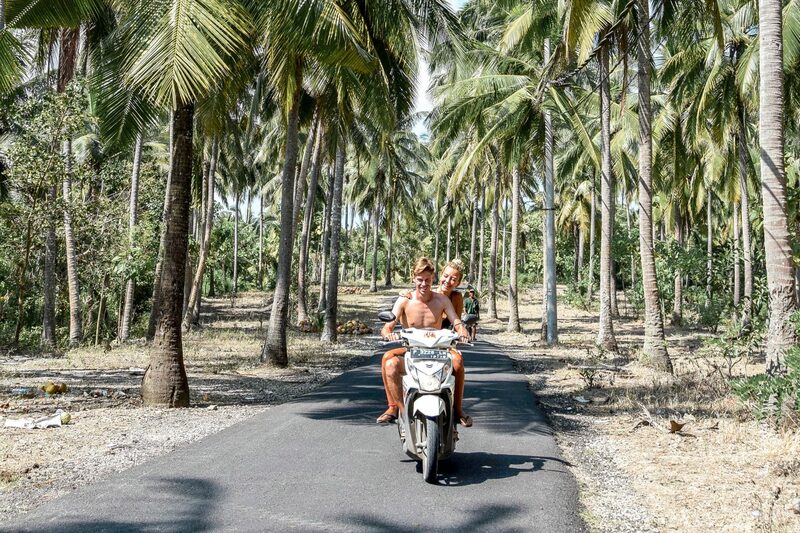 On the first day of our Nusa Penida tour we took a day trip with @balinusapenidatour who covered all the iconic spots with ease, so if you’d rather visit with a car and a driver we can highly recommend them. From Bali you can grab a fast boat from Sanur harbour directly to Nusa Lembongan. There are many competing tours and they charge around 150,000 IDR one way or 250,000 IDR for a return ticket. On the fast boat to Lembongan it takes roughly 30 minutes to get from Bali to Nusa Lembongan, and is a smooth enough ride depending on the weather. 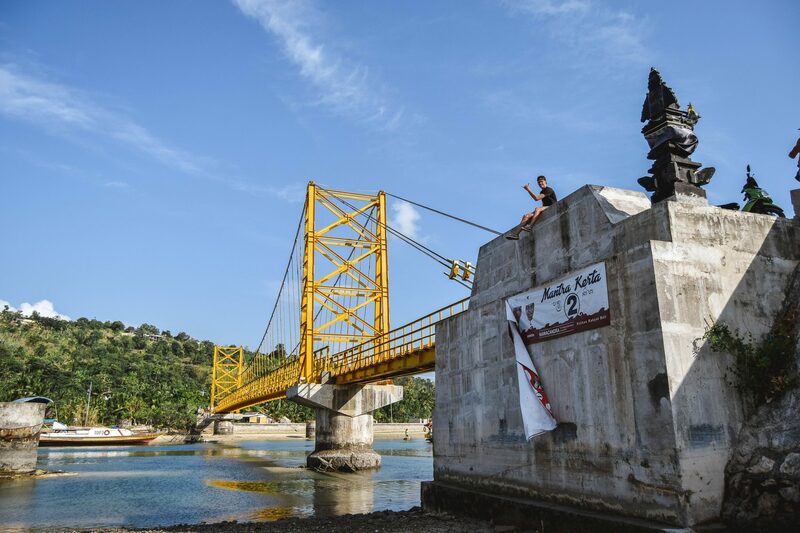 To cross over to Nusa Ceningan there’s only one option – the big Yellow Bridge! 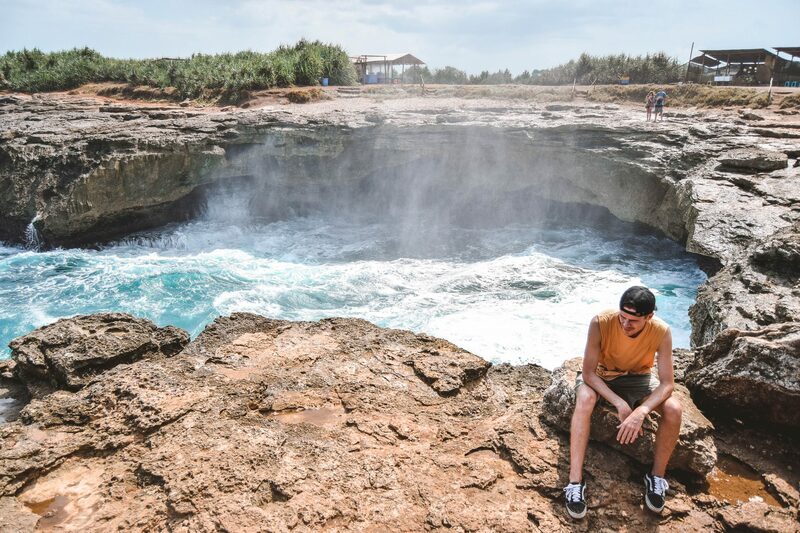 Devil’s Tears was the first stop of our Nusa Lembongan Bali tour. We arrived early in the morning and it definitely set us up for a full day of exploring Lembongan. With some of the craziest waves we’d ever seen, and a pretty cool spot for photographers, it’s definitely one of the top things to do in Nusa Lembongan Bali. 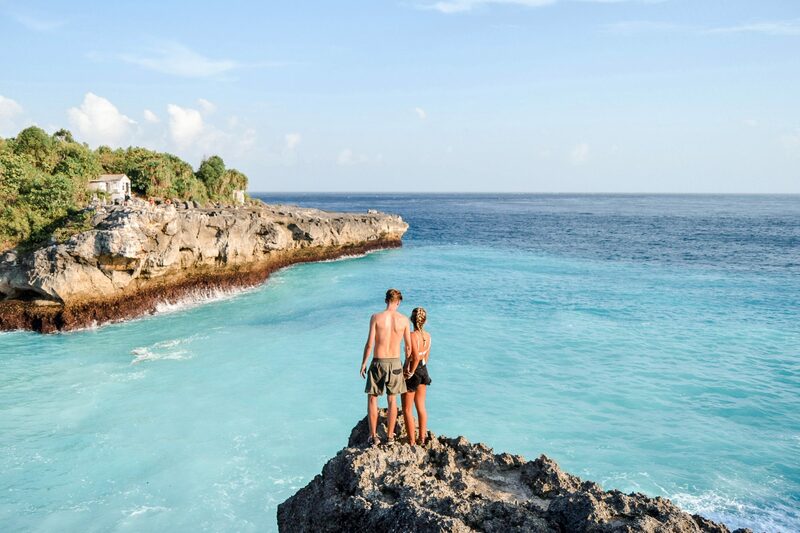 Click HERE for our full Devil’s Tears Nusa Lembongan blog, including prices and how to get there. With only a day to hit up all of the top spots in Nusa Lembongan we didn’t have time to go on a beach crawl. Although with Dream Beach being the most popular stretch of sand on the island, we swung by to check out the highly rated Nusa Lembongan Bali beach to see what all the fuss was about. And it didn’t disappoint! Click HERE for our full Dream Beach Nusa Lembongan blog, including prices and how to get there. Since the famous Yellow Bridge connecting Lembongan and Ceningan collapsed in October 2016 it has been rebuilt and renamed ‘The Bridge Of Love’. With many tourists coming to pay their respects and take photos of the brightly coloured landmark, we had to cross over it to get to Nusa Ceningan, so stopped to check it out. Click HERE for our full The Yellow Bridge – Nusa Lembongan To Ceningan blog. There’s a tiny sign and no real car park leading to the Blue Lagoon Bali lookout. Although after walking through a small dirt track and passing a few palm trees, we arrived at the bluest water we’d ever seen! If you’re on the hunt for cliff jumping in Bali, then the Blue Lagoon Nusa Ceningan is your spot. Be sure to add it to your things to do in Nusa Ceningan list. Click HERE for our full Blue Lagoon Nusa Ceningan blog, including prices and how to get there. 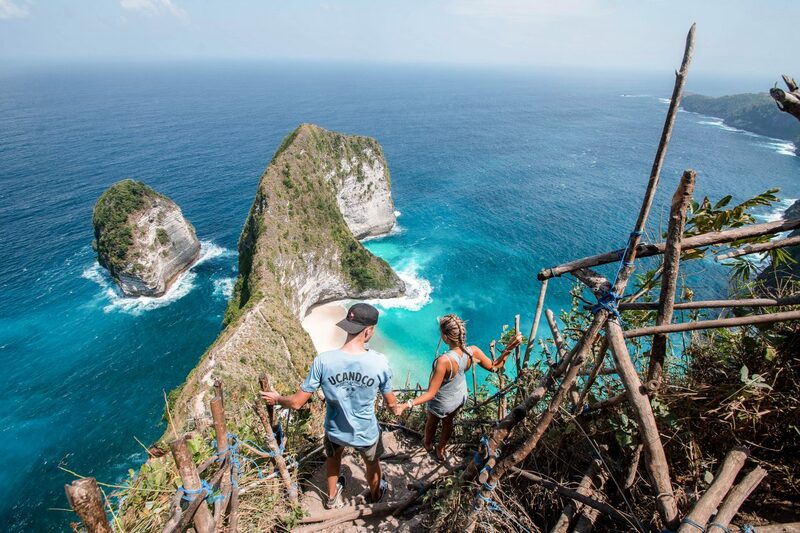 The ultimate spot for adrenaline junkies on Nusa Ceningan Island. Mahana Point Cliff Jump is a bar come restaurant with a difference. The difference being a 10m diving board attached to the side of the bar. So if you’re looking for a place to fling yourself off into the Bali Sea then you’ll love this spot. Don’t leave without completing this things to do in Nusa Ceningan MUST! Click HERE for our full Mahana Point Cliff Jump blog, including prices and how to get there. 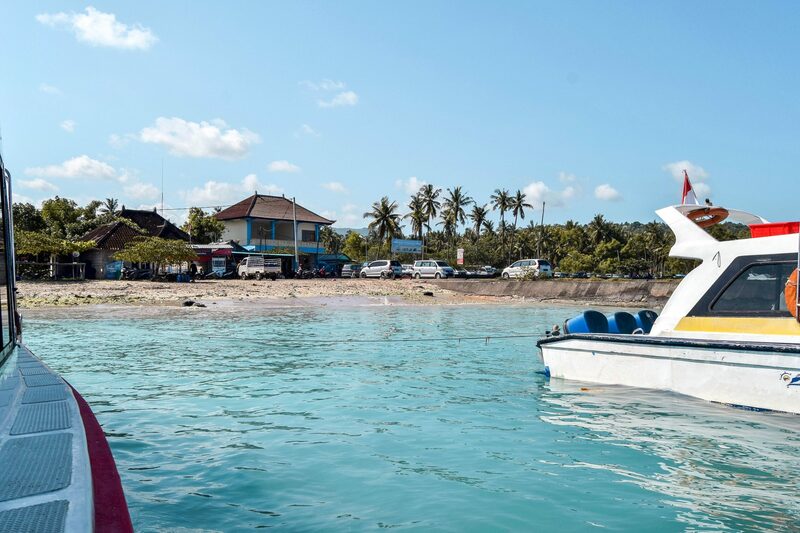 To get from Nusa Lembongan to Nusa Penida, the only option is to catch a fast boat from the famous Yellow Bridge! We made the mistake of heading to Mushroom Beach the morning we aimed to leave Lembongan and had to pay for a taxi transfer down to the Yellow Bridge. Learn from our mistakes! We’ve broken down our Nusa Penida itinerary into 3 days which worked perfectly for us. The main tourist spots are listed under day 1. The very first spot you should have pinned on your map when looking at your things to do in Nusa Penida itinerary. This T-Rex shaped cliff side at Kelingking Beach has rocketed tourism into the sky with it’s natural iconic beauty. Kelingking Beach itself is a secluded, white sandy haven surrounded by turquoise waters. To get down to Kelingking Beach takes around an hour and you must go at your own risk. The bamboo railings are not greatly maintained and you shouldn’t put 100% of your weight on them. Having said that, Kelingking Beach is a spot that cannot be missed on your things to do in Nusa Penida tour. Click HERE for our full Kelingking Beach – Nusa Penida, Bali blog. Angel’s Billabong is a very beautiful, naturally formed infinity pool. 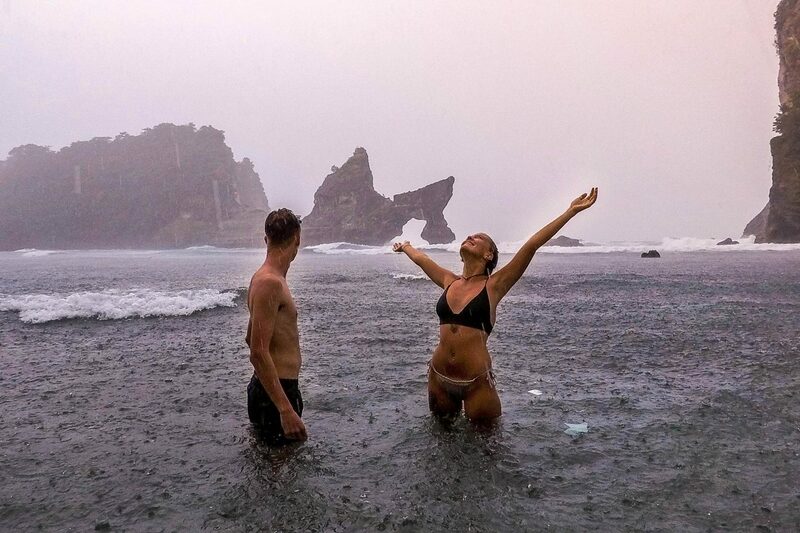 Nusa Penida is becoming more and more popular amongst tourists for it’s spectacular rock formations, although Angel’s Billabong is in a league of its own. We really enjoyed this spot on our Nusa Penida tour purely because it’s the perfect place to hang out with friends and watch the ocean crashing over the side whilst cooling off from those sweaty walks. Click HERE for our full Angel’s Billabong & Broken Beach blog. Just a short 5 minute trek around the corner from Angel’s Billabong comes another Instagram famous spot, Broken Beach. Broken Beach is another one of the top picturesque destinations on Nusa Penida Island. The arched tunnel allows the ocean to flow in making a natural pool and a great photo spot. 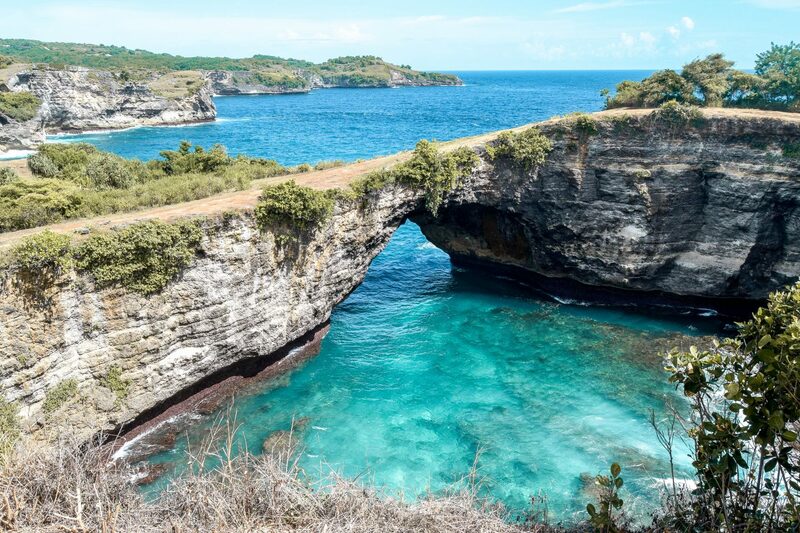 This along with Angel’s Billabong are two of the most popular spots for Nusa Penida tours as they are two of closest attractions to the ferry port. From Kelingking Beach, Angel’s Billabong and Broken Beach were around a 45 minute journey by car or bike. Palm tree heaven!… and that’s all you need to know. We were in our element at Crystal Bay with it’s aligned palm trees and private little beach. You have to venture through a whole jungle of trees before you get to it and it’s impossible to not stop and take a photo. Of all the things to do in Nusa Penida, Crystal Bay Beach is the perfect spot to finish in! Save some time at the end of your Nusa Penida itinerary for soaking up the sun or catching a sunset to remember. Click HERE for our full Crystal Bay Beach – Nusa Penida, Bali blog. 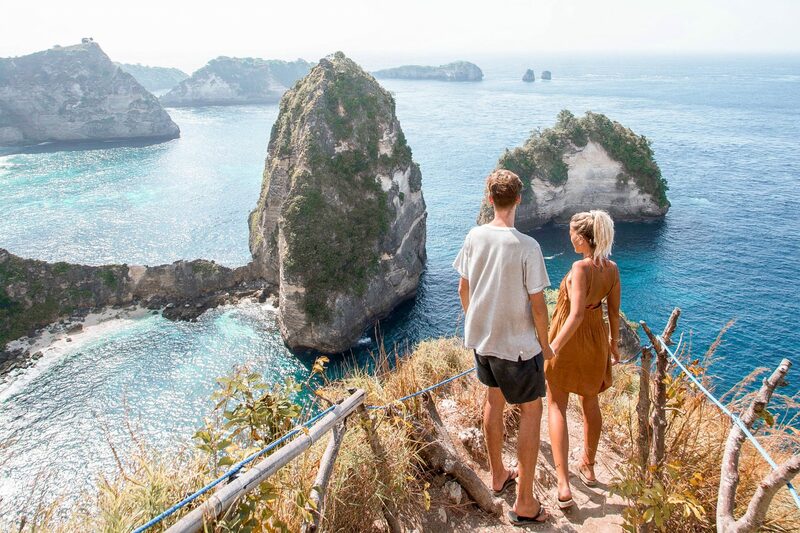 If you’re looking for one of the best viewpoints on the island then Banah Cliff Point should definitely be on your things to do in Nusa Penida list. We headed over early in the morning to catch a glimpse of the crazy cliff top lookouts and shimmering blue waters down below. 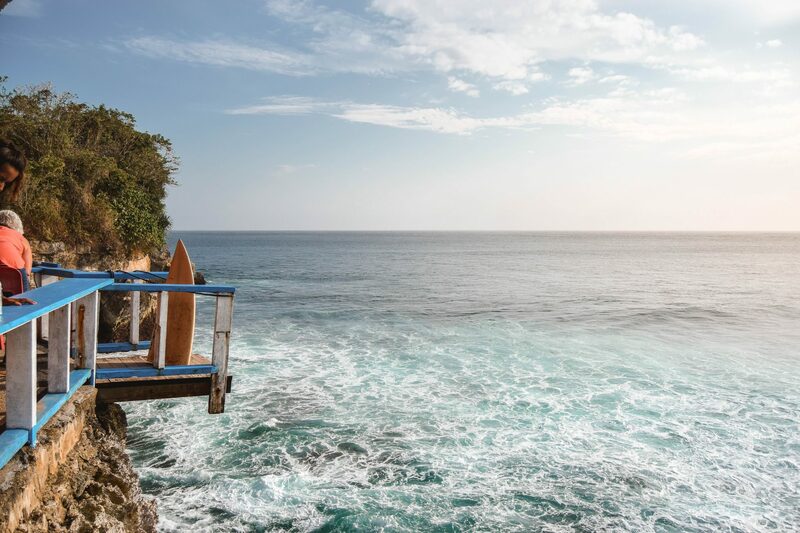 Click HERE for our full Banah Cliff Point – Nusa Penida, Bali blog. Banah Cliff Point is not always people’s top things to do in Nusa Penida, it depends what you’re into, but it’s definitely worth a stop. It’s peaceful and you feel on top of the world. 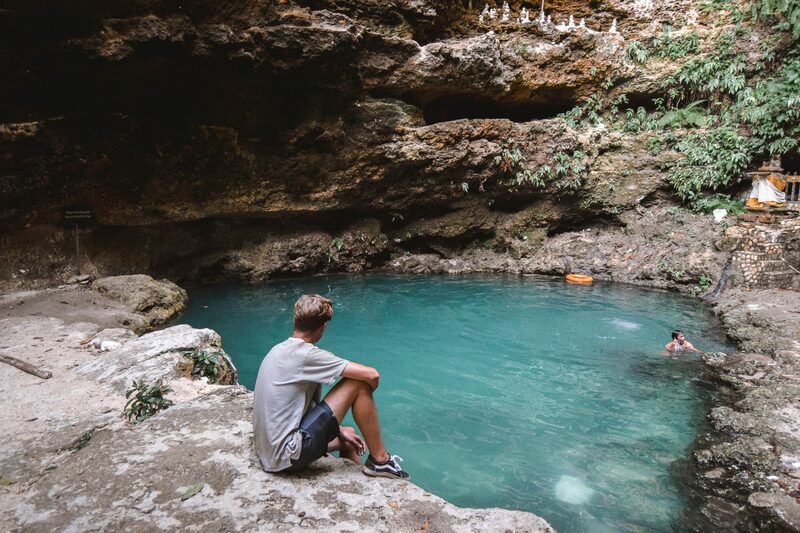 We were recommended by a local to check out the Tembeling Natural Pool and what a gem it was! One of the lesser known things to do in Nusa Penida it’s used as a watering hole by the people that live nearby. We googled some photos and jumped at the chance of diving into the tropical blue waters. A random natural pool that appears in the middle of the Tembeling Beach and Forest trail. 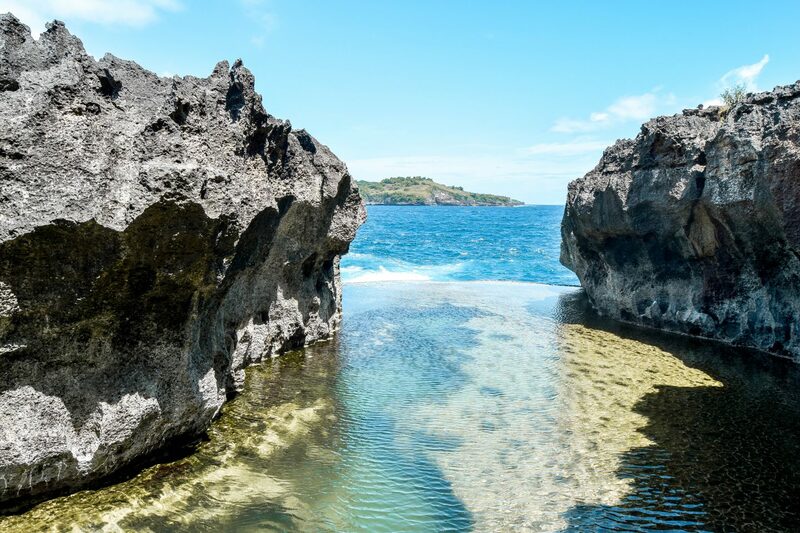 Click HERE for our full Tembeling Natural Pool – Nusa Penida blog, including prices and how to get there. Peguyangan Waterfall is an iconic spot for tourists and locals, most widely known for the Nusa Penida blue stairs. We’d heard the waterfall was a little underwhelming, if not non existent, but the cliff edge views made up for it. So we headed to the Southern point of the island to find out for ourselves. Click HERE for our full Peguyangan Waterfall – Nusa Penida blog, including prices and how to get there. Peguyangan Waterfall – a spot that went viral on Instagram. It’s also a really interesting and beautiful walk down. BUT, be ready for the walk back up! Rated one of the best beaches on Nusa Penida, the trip our East to Atuh Beach should definitely be one of the top things to do in Nusa Penida. Click HERE for our full Atuh Beach Nusa Penida, Bali blog, including prices and how to get there. Atuh Beach was insanely beautiful, in the rain and at sunrise. It’s all the way out east but definitely make the time but adding it to your things to do in Nusa Penida list! Rumah Pohon Molenteng, or the Nusa Penida Treehouse, is one of the most noticeable accommodations on the island. So we had to swing by and visit the magical place we’d seen online. It’s fair to say Rumah Pohon Treehouse is definitely one of the most random yet beautiful spots we’ve come across on our travels. Click HERE for our full Rumah Pohon – The Nusa Penida Treehouse blog, including prices and how to get there. The Rumah Pohon Treehouse was stunning. 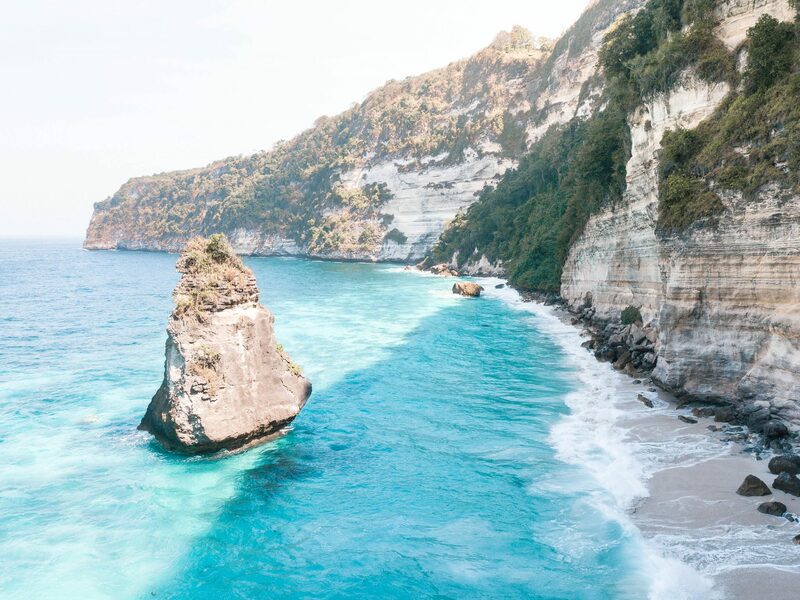 You should definitely add this to your Nusa Penida itinerary! You can kill two birds with one stone by visiting Rumah Pohon and Thousand Island Viewpoint on your Nusa Penida tour. The viewpoints is definitely one of the most spectacular spots on the island to take in the ocean breeze and spend a moment appreciating exactly where you are. We spent a good hour just relaxing on the cliff overlooking the islands and chilling out at Thousand Island Nusa Penida. 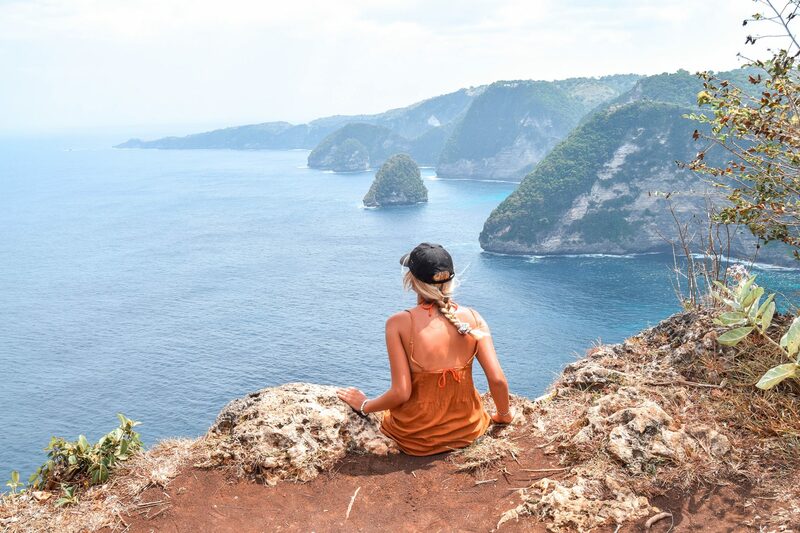 Click HERE for our full Thousand Island Viewpoint – Nusa Penida blog, including prices and how to get there. The final stop of our Nusa Penida itinerary and it was like revisiting the Philippines. The water from above at the lookout point at Suwehan Beach was blue beyond belief, and we couldn’t wait to get down the 342 steps to cool off. If you plan on visiting on your Nusa Penida tour though, make sure to check the tides first. 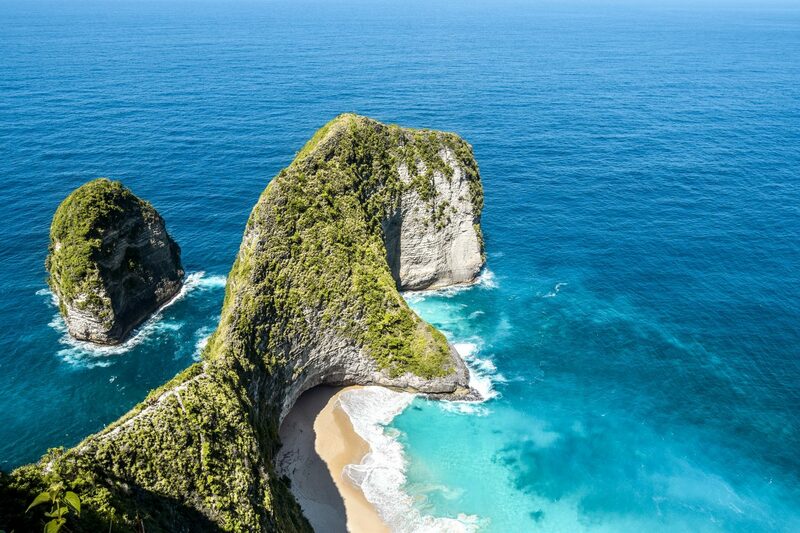 Click HERE for our full Suwehan Beach – Nusa Penida blog, including prices and how to get there. Suwehan Beach, with some of the bluest waters we’ve ever seen! Don’t miss it off your Nusa Penida itinerary! If you don’t have a return ticket and are unsure how to get back, head to Toya Pakeh Harbour. There are many ferry operators to choose from although we’ve only ever travelled with Dwi Manunggal and have had no problems. Their ferries run back to Sanur every day from Penida departing at – 7am, 9am, 2.30pm and 5pm. Luxury – The Acala Lembongan – Newly opened, we were lucky enough to stay at the beautiful Acala hotel and wake up to the amazing sunrise views over looking the infinity pool. Mid-Budget – Bali Nusa Villa – Conveniently located just around the corner from Mushroom Beach, Bali Nusa Villa has great ratings as well a great location. The cottages come with A/C, breakfast and back onto a beautiful modern pool. Backpacker – Pandan Wangi – Located in the north of the island and possibly the cheapest accommodation you’ll find on Lembongan. For other accommodation on Nusa Lembongan you can check the latest prices here. Luxury – Crystal Bay Villa & Residence – You can stay in one of the most luxurious Nusa Penida hotels for a not so hefty price and venture right out into the jungle of palm trees that is Crystal Bay. Mid-budget – Singable Bungalows – A great accommodation with all the luxuries you need for a comfortable stay, not forgetting the plush poolside. Budget – Deva Devi Beach Inn – A cheap and cheerful accommodation with great reviews and perfect if you’re travelling in style but on a budget. For other places to stay in Nusa Penida you can check the latest prices here. We're Charlie & Lauren, a free spirited couple from the UK. We combine our sense of humour, love of travel and passion for life to explore the world. Join Our Bali Group Trip – Travel With Us To Bali!